Got Questions about Lean culture and Problem Solving? Ernie and I will be on The Lean Post Wed 2/11 to answer questions. Ernie and myself are doing an "Ask us anything" post about Lean culture and Problem Solving and any other lean questions. If you would like to join in. Visit http://www.lean.org/LeanPost/Posting.cfm?LeanPostId=349 Will be live at 8am Feb 11th, 2015 (Wednesday), hope to field as many as possible. Hope you can stop by! Owners of Teaching Lean Inc.
What should be the "target" value-add percentage in a process? Hello everyone, Happy New Year a little late. I was traveling on the road all of Jan so this was my first week at home. Sorry for the blog delay. Trying to spread the good words of "Lean Thinking" all over!! This blog is a cross-blog share from theleanedge.org where thought leaders are discussing this question--here are my thoughts below. In the past several months I have had this question come up actually in different industries. So how should one determine or “calculate” value add percentage within a process (micro)? This can be subjective depending upon what you are measuring and how, but I know, based on my Japanese sensei’s, you can weave through a process and determine its value add and non value add content/percentages if you are conditioned to see it and categorize it. In manufacturing type work, by nature, can be easier to “see”. In M & I flow (for example) the “day and the life” of signatures needed on a document electronically, well– it’s not as easy but can be done if “go see” is involved with any primary process owner taking you through their steps. In my infant learning stage of lean thinking, before we called it that, I was told a good goal to start with is a 70% value add process. This says that we understand with any process there can be minor layers of non value added categories (described below). Our first goal is to recognize it and second is the minimize it. For example where I worked in Plastics we had mold changes daily. It was an accepted process we embedded into our day, and the changes were part of set up or ancillary work that supported the process, but its non value add to the customer in all reality. Our goal is not to eliminate it in this case, but to minimize all the waste involved in it–so waste within waste. If mold changes were steaks we would want a filet mignon version. I was taught by my sensei’s a tool called a Yamazumi board. This was a multi-function tool we could use for various things. This is basically a cycle bar chart in its essence, but this one is based on customer expectations which makes me back step into process capacity, machine capacity and manpower. Factoring all those in one could (if taken the time) can determine a takt time. If I have some level of takt time based on customer pull I can them determine a process necessary to meet expectations. Many are unwilling or unable to take the time to look through this lens of thinking for various reasons, some out of their control. 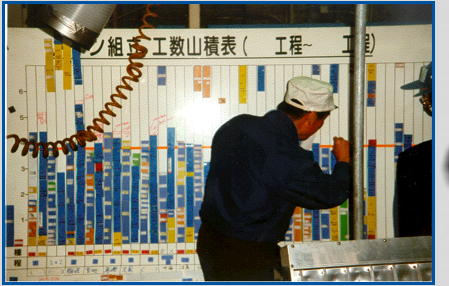 The yamazumi can categorize a process into the various type of work it has. I’ve seen elaborate yamazumi’s the Japanese trainers would create for an entire line trying to minimize and re-balance the work to be as value added (without muri and mura) as possible. You would have colored magnets that could be moved around that would describe for example – waiting, walking, machine time, delay work, downtime, conveyance, rework and actual working time. This would be considered a “grasping of the situation”.